Constructed to promote sustainability viaÂ minimized sourced material usage, Roberts PolyPro injection molded bottle handles are designed for comfort and strength and are 100% recyclable. 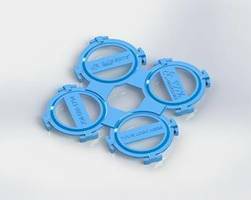 These high density polyethylene (HDPE) handles, offered in 2, 3, and multipack configurations, are available in any Pantone Matching System (PMS) color and labeled with Universal Product Code (UPC) stickers. Custom design and prototyping options for non-standard handles are available. These new handles source up to 25 percent less material than handles now on the market for greater sustainability. Roberts PolyPro is unique in offering a seamless migration path for customers. As sales volume expands for customers, Roberts PolyPro ensures the most cost effective tooling, handle style, and applicator are available to them. CHARLOTTE, N.C. — Roberts PolyPro, powered by Pro Mach, introduced today a new generation of injection molded bottle handles that reduce source material by up to 25 percent for greater sustainability. These handles are designed for comfort and for strength. As product sales grow for customers, Roberts PolyPro offers options that continue to ensure lowest overall lifecycle cost. Even with less material sourced, the Roberts PolyPro design promises superior holding power. 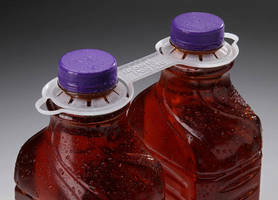 These new high density polyethylene (HDPE) handles are 100 percent recyclable. 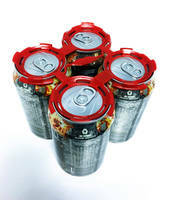 They are offered in two, three, and multipack configurations. The handles are available in any Pantone Matching System (PMS) color and labeled with Universal Product Code (UPC) stickers. The company offers custom design and prototyping for non-standard handles. Roberts PolyPro manufactures applicators suitable for every level of production, including semi-automatic, automatic, and high speed robotic machines. For more information on the new series of source reduced injection molded handles, contact sales at 800-269-7409. The full range of solutions from Roberts PolyPro can be viewed at www.RobertsPolyPro.com. 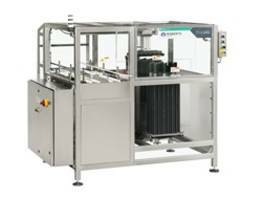 Roberts PolyPro, powered by Pro Mach, offers innovative product packaging solutions for consumer packaged goods and pharmaceutical companies. The company is a leader in manufacturing plastic and paper bottle carriers, box handles, pour spouts, j-hooks, and a complete line of standard and custom handle applicator and also feeder and folder/gluer machinery. Roberts Polypro is based in Charlotte, N.C. Visit Roberts PolyPro at www.RobertsPolyPro.com. Pro Mach is a leading provider of integrated packaging and processing products and solutions for food, beverage, consumer goods, pharmaceutical, and other diverse companies. Through its brands, Pro Mach provides product packaging and processing equipment, PMMI certified training, installation, parts, and service in Bottling & Capping, Primary Packaging, Flexible Packaging, Material Handling, Identification & Tracking, and End of Line Packaging. Pro Mach has a diverse customer base, from Fortune 500 companies to smaller, privately held businesses worldwide, which depend on reliable, flexible, technologically advanced equipment and integrated solution sets. Pro Mach is headquartered near Cincinnati, Ohio, with manufacturing facilities and offices throughout the United States, Canada, and Europe. For more information about Pro Mach, visit www.ProMachInc.com.